Can The Top Of A Bookshelf Hold A 29 Gal Tank?? Discussion in 'Freshwater Beginners' started by nataliagx3, Apr 14, 2017. I bought a 29 gal tank and am transitioning my tank from 17 gal to the 29 gal. I currently have the 17 gal on my dresser and its been fine there, but the 29 gal is longer so I couldn't put it on the dresser. 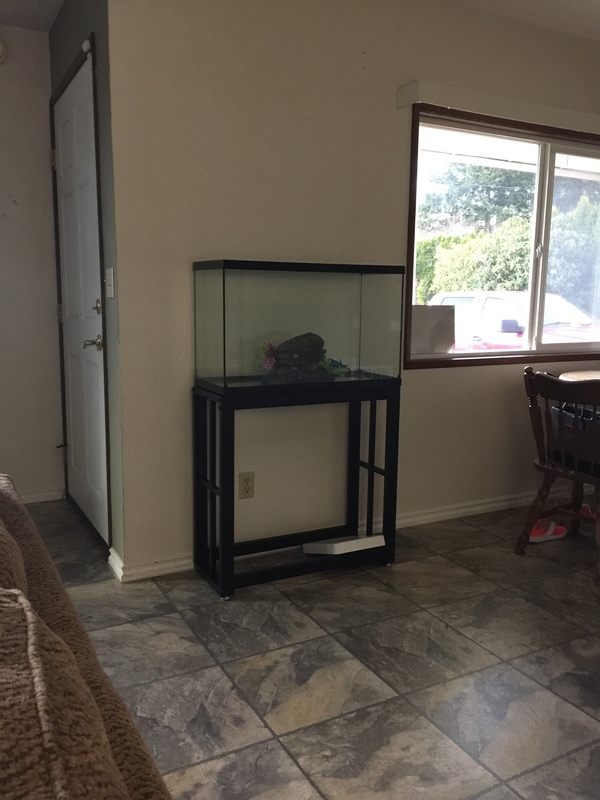 Can the top of a bookshelf hold a 29 gal tank with water? Could you post a picture of the bookshelf? Here's a picture of it. Its solid wood. Is it also solid wood in the back? What about the bottom. The sides look like they can take the weight more than likely, but you might want to put some little wooden angles in the front and back/ top and bottom for reinforcement and to help distribute the weight better. I agree with all the above. I've had a 20 long on a book shelf made of particle boards and screws. It was fine but then I noticed the boards on either end of the tank beginning to bend... I switched the tanks around and now a 10gal sits happily on the book shelf with no bowing boards. Luckily there are already build in support boards that are directly under where the tank sits. Another thing, if the tank can't sit evenly on whatever it's on then the weight will not be distributed proper and can cause the tank to leak and/or crack over time. Had that happen too. Looking at the pic, adding a couple of evenly spaced support boards near the mid-section of the tank will help out quite a bit, as will adding the angle in the corners. Ok thanks guys.. Where could i find the support boards and the angles? Home depot? If you could send a picture of what you mean by support board that would be greatly appreciated. I wouldn't chance it, might bow in the middle. You can buy 2x4 and make a support in the middle front and back that will help. Literally all you need is wood and long screws, shouldn't need angle brackets. If you want to go a step further add the wood along the ends as well. The supports MUST go from the top board to the floor though so the shelf will need some rearranging. You can also YouTube DIY aquarium stand and make one yourself. Still only need screws and wood. Maybe I'm being a cowboy, but it will weigh around 300 pounds. I'd buy a piece of 3/4 plywood the size of the shelf top, and put the tank on that. 300 pounds is not too bad. But I may also be careless - I am not in an apartment now. If it breaks, it'll cost you a lot more than a decent stand. Ideally your stand should be able hold 2-3x the total weight. A stand that can hold 600lbs will be best for this tank (safety wise). I think 1 2x4 standing upright can hold 200lbs (I read that on a site, might be more or less). If 6 2x4s get used (2 on the left, 2 in the middle and 2 on the right) that should be able to carry 1200lbs + the shear strength of the screws. Plywood would work but still, if the top of the desk bows so will the plywood which chances are will result in a split in the glass of the tank. I just went through this actually. Bought a book shelf that I thought would hold the tank not realizing it would weigh over 350lbs filled with water and sand. I ended up getting a new stand that would support the weight and give me peace of mind. Was only $38 and I love the way it looks. Honestly I think I'm just going to go ahead and buy a stand so I don't have to keep worrying. Thanks Allie I'll probably be purchasing that one. Seeking Suggestions On A Texas Boitope!